Chris is delighted to have been recently cast in Low Pay? 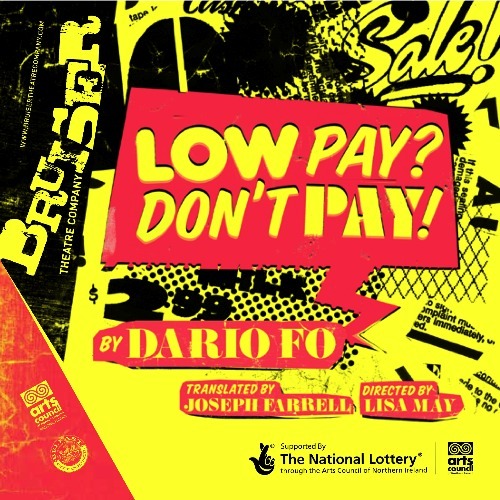 Don’t Pay!, the newest production from Belfast’s Bruiser Theatre Company. All details for the performances in Belfast and the subsequent tour to Scotland and through the Republic of Ireland can be found on the company’s website. This will be Chris’s first time working with artistic director Lisa May and the rest of the team at Bruiser, but he is very excited to be joining them for this topical Dario Fo comedy. Bruiser is delighted to be presenting the Northern Ireland, Republic Of Ireland and Scotland Premiere of this new version. Housewives, Antonia and Margherita, fed up with high prices in the supermarket, take matters into their own hands and start shoplifting. Keen to keep their light-fingered antics from their husbands, Giovanni and Luigi – not to mention the police – the women are forced to resort to more and more inventive hiding places and more and more elaborate cover stories, in this new version of the legendary comedy.